Pinus eldarica, Eldarica pine, a native to the Middle East, is one of the hardiest pines available for hot regions; even desert climates. 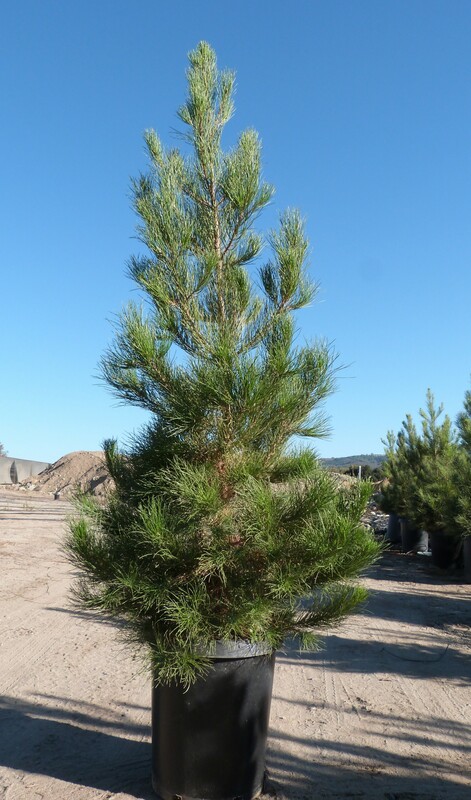 This pine works well as a single specimen or used in clusters as an attractive wind break. This beautiful tree has a conical growth habit typical of many pines, with relatively low branching; plants can be limbed up for a different look. Eldarica pines produce deep green colored needles in pairs that grow to 5- to 6-inches in length and 3-inch long oval cones. Plants grow rather large, reaching 30- to 50-feet tall and 20- to 40-feet wide; so be sure to select planting locations wisely and do not place too close to buildings or power lines. This moderately fast growing pine can grow from 12- to 24-inches per year. Though eldarica pine can tolerate a variety of soil types, it prefers well-draining soil. Heavy clay soil is not ideal for this pine as root rot is possible, especially during periods of heavy rainfall. Water eldarica pine regularly, until established. Once established, watering sparingly by soaking, as it does not tolerate regular irrigation. This drought and heat tolerant plant is relatively pest free but can have problems with aphids and pine tip moth, especially if stressed.